More Information About Cricut! You Don't Want to Miss It! Want the ability to easily make a personalized wedding gift or perhaps some unique home décor? Then you might find Cricut electronic cutting machines to be the best DIY crafting tool since the sewing machine. Precision - Features Cut Smart™ technology, which allows you to cut a wide range of shapes and sizes with exceptional precision, from ¼" tall up to 11½" wide x 23½" tall. Smart Set® Dial - Each machine features a Smart Set® dial, which sets your settings (e.g. speed, pressure, etc.) for you so you don’t have to keep track of them. You just select the material that you're using on the Smart Set® dial and the machine's Cut Smart® technology will deliver a clean, professional cut. 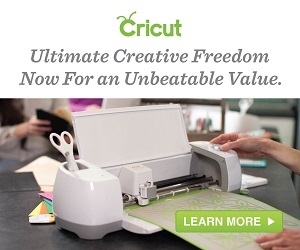 Images and Fonts - You can upload your own images and fonts for free on all three Cricut cutting machines. Cartridges - Both machines work with any Cricut cartridge and have the capability to hold all of your cartridges “virtually” in the cloud within your Cricut Design Space online software. So once you’ve loaded a cartridge, you’ll have it everywhere you go. Cricut’s Design Space™ and iPad® app - All Cricut Explore machines work hand-in-hand with Cricut’s Design Space™ (for PC, Mac®, iPad®, and iPhone®) that you get access to for free. It has a dual carriage for cutting and writing or cutting and scoring in one step. If you do a lot of paper crafting, this is the machine for you! It has built-in Bluetooth® capability. You just use Cricut’s free iPad app and design anything you want from your iPad, just like you would on your home computer, but with the convenience of being able to take your projects with you anywhere. Then, you can just wirelessly send your project from your iPad to your Explore Air to bring it to life. Now that you know a lot more about how Cricut Explore® machines work, I’ll focus next week’s post on how you can design here, there and everywhere with Cricut Design Space. You’ll be blown away by how easy it is. Until then … Happy crafting!